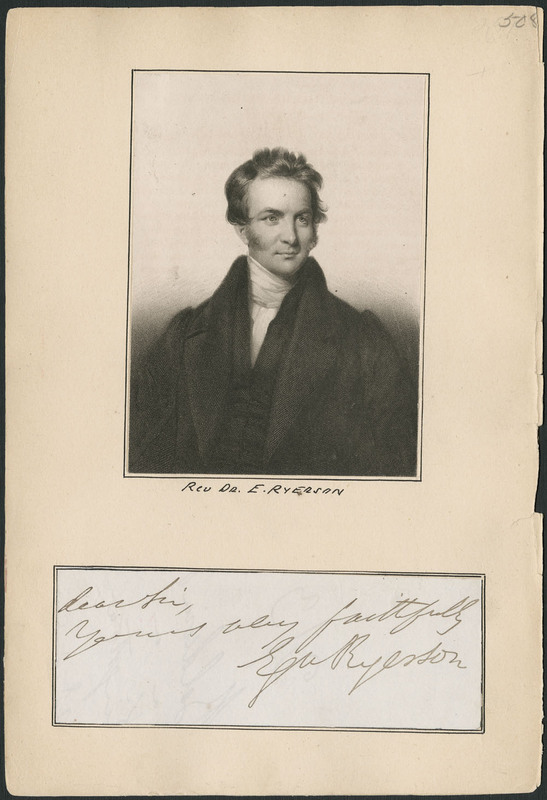 RYERSON, EGERTON (his complete given name was Adolphus Egerton but he never used the first), Methodist minister, author, editor, and educational administrator; b. 24 March 1803 in Charlotteville Township, Norfolk County, Upper Canada, fifth son of Joseph Ryerson and Mehetable Stickney; m. first 10 Sept. 1828 Hannah Aikman (d. 1832) at Hamilton, Upper Canada, and they had two children; m. secondly 8 Nov. 1833 Mary Armstrong at York (Toronto), Upper Canada, and they had two children; d. 19 Feb. 1882 at Toronto. Two circumstances in Egerton Ryerson’s early life exercised a lasting influence on his career. One was the loyalist environment in which he grew up. His father, Joseph, and his uncle Samuel Ryerse*, both American born, had served as loyalist officers in the American revolution and afterwards had fled north to New Brunswick before moving to Upper Canada in the 1790s. As a half-pay officer Joseph had received a substantial land grant and established his family on a farm near Vittoria, the first capital of the London District. Appointed to a series of important local offices, both Joseph and Samuel became part of the loyalist establishment in the district while members of their families married into other leading loyalist clans in the area. Joseph and his three eldest sons all served against the Americans in the War of 1812. Egerton, too young to be actively involved, saw a brother badly wounded and the destruction of lands and property belonging to friends and relatives. Among the Ryerson family, memories of pioneering a new land and defending it, of principles sustained and loyalty reaffirmed, would breed a deep and abiding attachment to both their native land and the maintenance of the British connection in North America. The second great formative influence was evangelical Christianity. Like so many of his generation Ryerson was touched early in life by the wave of Protestant revivalism that swept North America in the late 18th and early 19th centuries. The Ryerson children were raised by a devout mother of Methodist sympathies who taught them a personal and vital form of Christian belief and her precepts were reinforced by the Methodist circuit-riders who criss-crossed Norfolk County during Egerton’s childhood. Some time immediately after the War of 1812, according to his own account, Egerton, like three of his elder brothers, “became deeply religious. . . . My consciousness of guilt and sinfulness was humbling, oppressive and distressing; and my experience of relief, after lengthened fastings, watching and prayers, was clear, refreshing and joyous. In the end I simply trusted in Christ, and looked to Him for a present salvation. . . .” In 1816 his mother and two of his older brothers joined the Methodist Church. His Anglican father was “extremely opposed” to the Methodists and when at 18 Egerton applied for membership in the local Methodist society he was told “you must either leave them or leave my house.” Egerton took the latter course. The rift lasted for two years and was repaired only when the father acquiesced in his son’s convictions. The episode reveals something of the determination and impetuosity characteristic of Ryerson all his life. It also reveals the depth of his “conversion” experience. From the time he was a young man Ryerson’s personal odyssey was defined by his determination “never to rest contented until he [Christ] becomes not only my wisdom, but my sanctification and my full redemption.” Loyalism and Methodism would form the warp and woof of Ryerson’s life and thought throughout his long career. Ryerson’s family was sufficiently well off to enable him to take advantage of the limited educational facilities available at the time. Most of his schooling took place under James Mitchell at the London District Grammar School in Vittoria. Between 1821 and 1823 he served as an assistant to his brother George, who was master in the school. During these years Ryerson absorbed the essentials of an English and classical education and was also introduced to two works that would become lasting influences – William Paley’s Principles of moral and political philosophy and Sir William Blackstone’s Commentaries. In August 1824, perhaps with the intention of becoming a lawyer, Ryerson went to Hamilton to study with John Law at the Gore District Grammar School. After only a few months’ study in Hamilton, Ryerson’s formal education was ended by a prolonged illness in the winter of 1824–25. During his recovery he became convinced that he had been preserved from death to serve God’s purpose as a Methodist minister. He irrevocably accepted God’s call on 24 March 1825, his 22nd birthday, and preached his first sermon at Beamsville on Easter Sunday of that year. Thus Egerton became one of five Ryerson boys to enter the Methodist ministry: he followed in the footsteps of William* and John* as George, the eldest, and Edway (Edwy) Marcus, the youngest, would follow in his. Formally received on trial in September 1825 by the Canada Conference, the governing body of the Methodist Episcopal Church in Upper Canada, Egerton served his apprenticeship on the York and Yonge Street circuit and then as a missionary among the Indians at the Credit River. 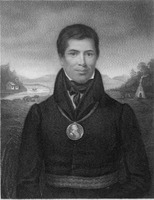 In September 1827 he was admitted to full connection and ordained. He spent the next two years assigned to the Cobourg and Ancaster circuits. During these years the rigorous routine of a travelling preacher’s life was interrupted by two diversions that would put Ryerson’s name before a much wider audience than any Methodist circuit could offer. 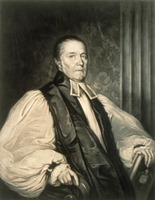 In 1826 a sermon, delivered the previous summer at the funeral of Bishop Jacob Mountain* by John Strachan*, appeared in print; in it Strachan, the leading Church of England clergyman in Upper Canada, traced the rise of the Anglican church in the colony, contending that it was the established church and attacking the Methodists as ignorant American enthusiasts, unsound in religion and disloyal in politics. None of the arguments were new, but on this occasion the Methodists in York chose not to remain silent and Ryerson, still a probationary preacher, was one of those invited to frame a reply. In a long letter printed in the Colonial Advocate (York) in May 1826 he challenged all of Strachan’s assertions. No less than Strachan himself, Ryerson sought a society that was both Christian and British. But he denied that an established church was either scriptural or an essential part of the British constitution, and quoted authors ancient and modern to support his case. He rejected the charges of ignorance by citing the intellectual training required of all Methodist preachers and also challenged the contention that most of them were Americans. Ryerson’s letter and the ensuing debate in the provincial press “thrilled the Methodist mind in the country,” in the words of John Saltkill Carroll, and called attention to Ryerson’s remarkable abilities as a spokesman for the Methodist cause. In 1827 Strachan again put forward his claims in a series of letters written in England to garner support for both the Church of England and the colony’s newly chartered university. 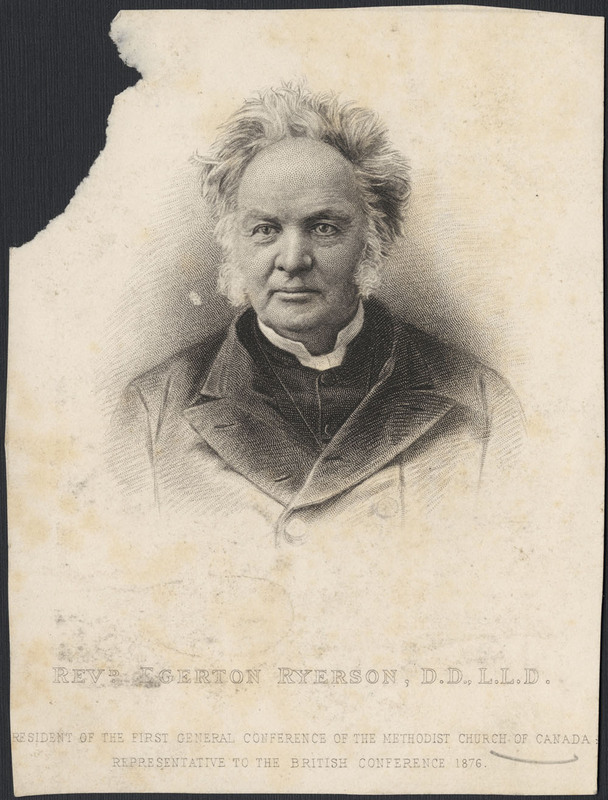 In the public uproar that followed, Ryerson was only one critic among many, but in eight clearly reasoned and broad-ranging letters, published first in the Upper Canada Herald (Kingston) in June 1828 and later that year as a pamphlet, he again defended the character of Methodism, argued the case for religious equality, and broadened his attack to include the educational policies of what he claimed to be an Anglican-dominated executive. His forays against Strachan brought Ryerson to the centre of Methodist affairs. In 1829 he was elected by conference as the first editor of the new Methodist newspaper, the Christian Guardian. Over the next decade he would be its dominant editorial voice, responsible for the paper from the first issue in November 1829 until August 1832, from October 1833 until June 1835, and again from June 1838 until June 1840. A large Methodist constituency and Ryerson’s own editorial talents made the Guardian one of the most widely read and politically influential papers in the colony. From the beginning it reflected not only the temporal but also the spiritual concerns of Ryerson’s own life. One subsidiary object of the paper, he wrote in 1830, was “to support and vindicate religious and civil rights”; but the paper’s principal purpose was to promote “practical Christianity – to teach men how to live and how to die.” Serving also as book steward for 1829–32 and 1833–35, Ryerson established a book room and helped lay the foundations of a flourishing publishing establishment which eventually became the Ryerson Press. The style and character of the man had also begun to take permanent shape. Summarizing contemporary opinion, Charles Bruce Sissons* concludes that Ryerson was a competent rather than an outstanding preacher. The basis for his public reputation would lie in the written rather than the spoken word. At his best Ryerson could write prose laced with vigorous rhetoric, flashes of wit, and powerful imagery. He could also, particularly as he grew older, be long-winded and pontifical, his prose weighted down by endless quotations and irrelevant appeals to the history of any subject from time immemorial. His style was shaped by the Methodist homiletics of the day and encompassed the best and the worst of the genre. Throughout his life Ryerson was a relentless worker. He could call up enormous reserves of energy, endurance, and discipline – products of his early labours on his father’s farm, the physical rigours of a circuit-rider’s life, and above all, the conviction that he must be a worthy steward of the time God gave him. He was also a constant student. He was forever learning a new language: Ojibwa at the Credit River mission, Hebrew in his spare time in the early 1840s, French and German on his trips to the Continent. The core of his religious and social thought had been shaped by rigorous study of the scriptures and the great Methodist divines: Wesley himself, Adam Clarke, and Richard Watson. He was also an avid reader of the classics of British and European history and political thought, and the “serious” contemporary literature such as the great English quarterlies. On any subject he chose he could command a remarkable variety of sources and quotations. His persistent interest in secular knowledge and in contemporary cultural and political affairs tempered the asperities of a faith that in other men could breed a disdain for temporal things or even an outright anti-intellectualism. 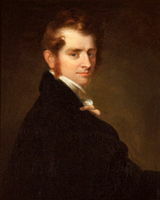 On the other hand his secular interests, reinforced and justified by his religious convictions, also drew him into the political conflicts that haunted the colony in the 1830s and 1840s to a degree that, amongst Upper Canadian clergymen, was matched only by his great antagonist, John Strachan. As pamphleteer and editor between 1826 and 1832 Ryerson had gradually become associated in the public mind with those who identified themselves as political Reformers. 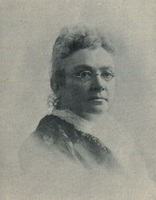 It was a natural alliance at the time, for many of the issues that galvanized Reformers were also those of most concern to Methodist leaders: the disposition of the clergy reserves, the right to solemnize marriages, the control of many of the educational institutions by the Church of England, and a number of similar issues affecting denominational equality Ryerson’s spirited editorial attacks on Anglican ascendancy, his leading role in organizing and drafting the petition of the Friends of Religious Liberty in December 1830 [see Jesse Ketchum*], and his denunciation in 1831 of the attack by Sir John Colborne* on the Methodists for political meddling, all seemed to identify him not just as a leading Methodist but as a leading Reformer as well. Thus it was not surprising that in 1832 a Tory mob in Peterborough, looking for symbols of reform on which to vent their anger, set fire to effigies of both William Lyon Mackenzie* and Ryerson. When Ryerson returned from England in the autumn of 1833, however, he struck an unexpected theme. In the first of a series of “Impressions of England,” published in the Guardian, he attacked as infidel, republican, and anti-Methodist, radical leaders such as Joseph Hume and John Arthur Roebuck* who were close allies of Canadian Reformers. At the same time he praised the English “moderate Tories” among whom were to be found “a considerable portion of the evangelical clergy and, we think, a majority of Wesleyan Methodists.” Their political prudence, “genuine liberality and religious beneficence,” he concluded, “claim respect and imitation.” The “Impressions” caused a political uproar. To friends and enemies alike Ryerson appeared to reverse direction and commit himself to Toryism. The Reform press had a field-day at his expense, condemning him as an apostate and traitor, and many of his Methodist brethren concurred. To Ryerson himself, however, the change was one of emphasis, not principle. His passionate recitals of the grievances of Upper Canada had in fact masked an intellectual temper that was profoundly loyalist and conservative. The second fundamental principle that shaped his political thought was the importance of the imperial tie. Given his warm attachment to British institutions, all proposals for outright independence were anathema. At the same time he believed that the imperial authority and its local representatives must be responsive to local interests and circumstances. Thus Ryerson, like so many others of his generation, had to come to grips with a proposition that, on the face of it, seemed absurd: Upper Canada could be both self-governing and a colony. If some believed that sentiment alone could keep separatist tendencies in check, many others, Ryerson included, did not. To him, the “responsible government” of Robert Baldwin* was but a first step to independence. Its logic was to destroy the mixed constitution by eliminating the independent prerogative of the crown, the most palpable link between colony and parent state. 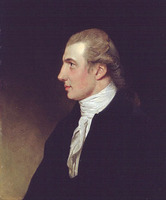 So long as the imperial government was broadly responsive to public opinion, preserved the right of appeal for redress, and followed existing constitutional usages in dealing with the colony, Ryerson would oppose any innovations that threatened to weaken the imperial tie or modify the constitution inherited by the colony. From the late 1820s until the mid 1840s Ryerson would attempt to govern his political course in accordance with these two principles. It was not an easy task. It would lead him from one side of the political spectrum to the other and back again, and leave him open to charges of political opportunism that, in the eyes of many Upper Canadians though not in his own, were difficult to refute. By late 1833, when he published “Impressions,” Ryerson had become convinced that the main enemy was the Reform movement, not the administration. 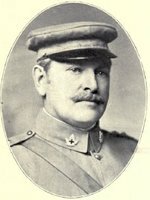 He did not dispute the fact that Upper Canadians still had justifiable complaints but, he argued, appeals to the crown and the imperial parliament were bringing redress. 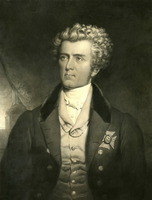 In particular, the royal dispatches of 1832 and 1833 had led Lieutenant Governor Colborne to modify many of the partisan policies of the previous decade. To Ryerson, in other words, the cause of Reform had been largely won. Of course Methodists had changed their tune, he would reply to his critics in 1835, “and for a simple and sufficient reason, the administration of government towards them has been essentially changed.” The Reformers, on the other hand, were seeking no longer to remedy real grievances but to introduce organic changes in the constitution. Thus, with the same energy he had exerted on behalf of Reform in the early 1830s, by mid decade Ryerson had thrown himself into the defence of existing authority. Ryerson was absent from Upper Canada from November 1835 to June 1837, having been sent by conference to England as part of an attempt to put the affairs of the Methodists’ new academy at Cobourg in order. Begun with the greatest optimism in the early 1830s, Upper Canada Academy was in the most desperate financial straits by mid decade. It was Ryerson’s job to obtain a royal charter for it and, more importantly, to travel throughout Britain soliciting money for its support. Both tasks proved difficult but the latter was the more painful: to be a stranger and to have to beg, he confided to his diary, was “the most disagreeable of all employments.” He obtained the charter, none the less, and promises of financial support from British Wesleyans and the imperial government. Though away from home during these months, he continued to be a force in Upper Canadian politics, writing lengthy letters to the Christian Guardian and to English newspapers criticizing the Reformers and defending the policies of Lieutenant Governor Sir Francis Bond Head*. Ryerson ended 1837 with a blistering sermon condemning those who had participated in the rebellion. He himself, however, was already beginning to have second thoughts about Head’s administration. It was one thing to defend the existing constitution against “republican” or “democratic” radicalism but quite another to tolerate arbitrary rule. Despite the clearly expressed will of the crown and the assembly, the Legislative Council had refused to approve a loan to Upper Canada Academy in 1837 – a scandalous departure, Ryerson argued, from constitutional precedent. A Tory legislature appeared to be attempting once more to place the clergy reserves in Anglican hands. In the wake of the rebellion civil liberties were being trampled upon and early in 1838 the case of Marshall Spring Bidwell*, who had been forced into exile at the whim of the lieutenant governor, roused Ryerson to issue a ringing public denunciation of the authorities and a defence of the constitutional rights of the subject. In Ryerson’s view Head’s successor, Sir George Arthur*, brought no improvement; indeed Arthur seemed determined to sustain all of the most objectionable pretensions of traditional colonial Toryism. From June 1838, when Ryerson returned as editor of the Guardian, his energies were again directed towards attacking the policies of the local executive and its supporters inside and outside the legislature. Once more he had entered the camp of the anti-government alliance. In June 1840 Ryerson ended his last stint as editor of the Guardian and was assigned to a pastorate in Toronto. He remained, however, a central figure in Methodist affairs. A number of issues had begun to divide Canadian and British Wesleyans in the late 1830s, raising doubts about the value of the union into which they had entered in 1833. One of these was the editorial policy of the Guardian, which members of the British conference felt Ryerson had made into “a political and party organ” of colonial radicalism. Though Ryerson was sustained by large majorities at conference, clashes over this and other matters of policy led to the dissolution of the union in 1840. 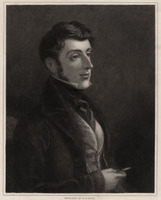 Egerton and his brother William were appointed delegates to the British conference and spent the summer of 1840 in England negotiating the details of separation. 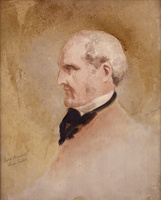 In the following year Egerton was selected as the first principal of Victoria College, the successor to Upper Canada Academy, though he was not formally inducted into the post until June 1842. He remained principal until 1847 but his active role in the college was short-lived. In 1844 he took up a new post as a government administrator and, at the same time, became involved in one of the most celebrated political conflicts in Upper Canadian history. 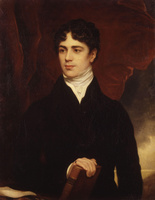 In November 1843, because of a dispute over control of patronage, Governor Sir Charles Theophilus Metcalfe*’s Reform ministers had resigned from office. 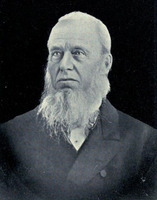 In the next few months Metcalfe and his new chief minister in Canada West, William Henry Draper*, began to search for a base of support in the leading moderates of both parties and all denominations. Among those consulted for general advice was Ryerson and, most probably in January 1844, consultation turned into a more positive offer of a place in the administration. It is not difficult to see why Metcalfe wanted Ryerson. An appointment for Ryerson would disprove charges that he was too partial to Anglicans and high Tories and would favourably influence the large Methodist vote. Ryerson was on close terms with other political moderates and his accession might bring their support as well. A place on the council itself was, however, out of the question. Ryerson did not want an unequivocally political appointment and Draper discovered that it was not possible in any case. Thus Ryerson was offered the post of superintendent of schools for Canada West, which was not formally political; his acceptance would, however, signify his support for the ministry. Why Ryerson himself was tempted by the offer is another question. Certainly he believed that at stake was a major constitutional issue upon which men must declare themselves. Moreover, he had always thought that an effective system of national education was one of the highest goals of practical, liberal policy and he was no doubt deeply attracted by the chance to play a role in promoting its development. But there may have been other reasons as well. On two previous occasions in the early 1840s he had expressed an interest in becoming involved in primarily secular projects and it may have been that Ryerson was somewhat restless in these years and eager to test his talents in a wider sphere than that afforded by Upper Canadian Methodism alone. He may also have been tempted by the new political atmosphere of the years after 1840. The many leading politicians of the decade with whom he was on close personal terms accorded him a degree of respect he had not received from an earlier generation of Upper Canadian notables. Moreover, whatever their differences on particular issues, Ryerson’s vision of the future development of Canadian society had much in common with that of such men as Draper and Francis Hincks. They were ready to recognize the legitimate interests of Methodists and other dissenters within the body politic, they were men of the centre who rejected the extremes of either radicalism or Toryism, and their concern for economic development and the modernization of public services and institutions was as great as their commitment to the preservation of a distinct British-American society. In other words, Ryerson may have been attracted to the job because he believed that politics and policy were moving in more congenial and promising directions than in the conflict-ridden decade of the 1830s. 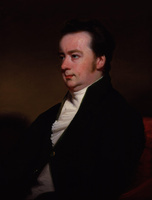 In any case and for whatever reasons, Ryerson accepted Metcalfe’s offer in early 1844, though his appointment was not formally announced until September. Apparently Metcalfe and Draper had asked only that Ryerson agree to serve as superintendent of common schools. It seems to have been Ryerson himself who proposed that he also step into the public arena in defence of the governor. He did so in part because he thought that his appointment was at risk unless the ministry was sustained by the electorate. But his behaviour was also fully in character. For Ryerson it was never enough to stand up and be counted; he had to smite the enemy hip and thigh as well. Thus he set about writing Sir Charles Metcalfe defended against the attacks of his late counsellors, published first as a series of letters in the British Colonist (Toronto) in the late spring and early summer of 1844 and later that year as a pamphlet of some 165 pages. The Metcalfe ministry won the elections of 1844 for many reasons, though no doubt Ryerson’s “Defence” and the loyalty cry he helped to raise played a part in influencing moderate opinion. His appointment to an important public position may also have influenced Methodist voters for it represented a long-delayed recognition of their importance and their claims to full membership in Upper Canadian society. The affair also won Ryerson the lasting enmity of some Reformers, George Brown* amongst them, and a recurring epithet, “Leonidas,” for Ryerson’s smug comparison of his own role in 1844 with that of the hero of Thermopylæ. Ryerson himself left Canada West in October 1844 for his first tour of educational establishments in Britain and on the Continent, and did not return until December 1845. In the following year, working closely with Draper, he began the task of reorganizing the structure of elementary education in the colony. He could not, however, detach himself immediately from the political role he had played in 1844. He had publicly allied himself with Metcalfe and with Draper’s Conservative ministry. Upon the victory of the Reformers in the elections of 1847–48 it was commonly rumoured that Ryerson would be replaced as superintendent of schools. He survived for several reasons. Impressed by his competence, Lord Elgin [Bruce*] gave Ryerson his full support against those who wished to dismiss him for political reasons. 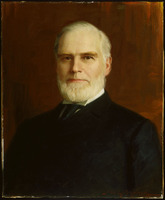 Ryerson also had warm allies within the ministry, such as William Hamilton Merritt*, and influential admirers within the party. Above all, Francis Hincks, worried about the Methodist vote, was prepared to bury the political enmity of the mid 1840s. By late 1849 Ryerson had prevailed. His chief enemy in the ministry, Malcolm Cameron*, had resigned, new school legislation that undercut Ryerson’s position had been set aside, and Ryerson had been invited to remain in office and to prepare a revised school bill incorporating the experience of his four years as superintendent. The way was now clear for him to begin the most significant phase of his life’s work. 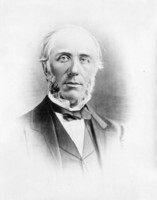 Ryerson’s main preoccupation in the two decades after 1850 was to give form and substance to his vision of the appropriate system of education for Canada West. That vision had been taking shape for years, derived in equal parts from the lessons of scripture and Methodist theology, from his reading of the early 19th-century debates in Britain and America about the importance of popular education, from his participation in the editorial warfare over educational policy in Upper Canada, and from his study of other school systems during his tour of Europe in 1844–45. Though Ryerson wrote voluminously about education throughout his public life, his ideas were expressed most fully and systematically in his Report on a system of public elementary instruction for Upper Canada, written after his return from Europe. From these principles Ryerson drew his particular goals. First and foremost, a system of education must be Christian: a secular education was a danger to the child and the society as well as a denial of God’s message to mankind. Secondly, in order to have its intended effects on all children, schooling must be universal. A truly national system must also be “extensive” or “comprehensive”: it must meet the needs of all ranks and vocations by providing both elementary and advanced institutions of education. As well the system must be both British and Canadian. The schools had a duty to uphold the British tie and respect for British constitutional government, and at the same time to foster local patriotism and serve the particular needs and circumstances of Upper Canada’s social and economic life. Finally, the system must be the active concern of government. As an ordinance of God “designed by the Supreme Being ‘to be a minister of God for good’ to a whole people,” government had a duty to sustain and encourage those institutions which promoted the temporal and eternal welfare of its citizens. These were the goals Ryerson would pursue in his remarkably long career as superintendent of education in the upper province. 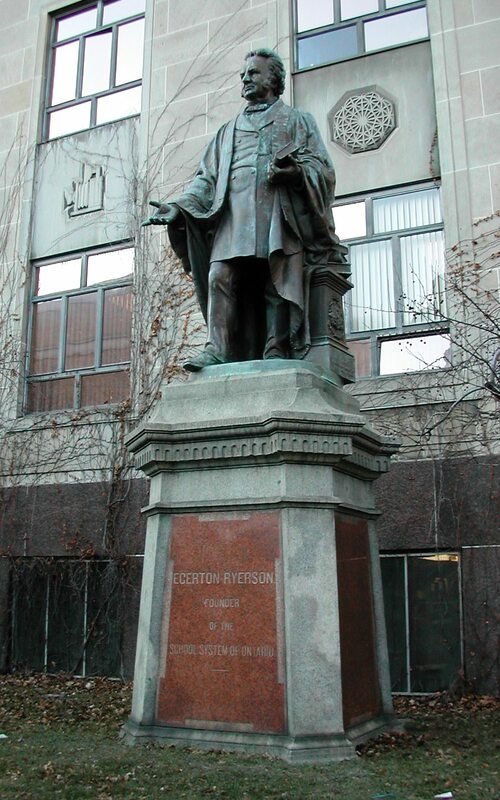 When Ryerson first took office in 1844 there were already more than 2,500 elementary schools in Canada West: financed by a combination of government grants, property taxation, and tuition fees; run by locally elected boards of education; and supervised and coordinated, though in a somewhat ineffective way, by an established central Education Office. Ryerson, in other words, did not create a school system; he inherited one. Throughout his career, moreover, his success was in large part the product of a climate of opinion highly favourable to his aims. Politicians, editors, and other public figures of all religious and political persuasions were sympathetic to the expansion of schooling. School boards and taxpayers provided most of the financial and political support at the local level and imposed broad limits within which central policy could operate. Thus system-building was a cooperative venture rather than the sole achievement of any one individual. More than anyone else, however, it was Ryerson who gave the emerging system its particular shape and character. Between 1844 and 1876 he was involved in a multitude of projects, ranging from the drafting of his major school legislation of 1846, 1850, and 1871 to writing school textbooks, promoting school libraries, and creating a museum of art and science. But his four major achievements were the creation of conditions which made universal access to elementary education possible, the promotion of improvements in the quality of the school programme, changes in the function and character of the grammar schools, and the establishment of an effective administrative structure. He sought universality and improved quality in several ways. In a period when much of the province was still being settled Ryerson provided the legislative and financial devices that enabled even new, small communities to provide schools for themselves. He also led the campaign, which culminated in the Schools Act of 1871, to make every elementary school tuition-free and to introduce Ontario’s first tentative measure of compulsory attendance. For Ryerson, however, it was not enough to ensure that the rudiments alone were universally available. Through exhortation and regulation he tried to make certain that the programme of studies extended well beyond the “three Rs” so that the elementary schools not only began but completed all of the schooling most children and their parents would want or need. He tried to ensure that textbooks were pedagogically sound and reflected the political, social, and religious values he believed should underpin Upper Canadian society. Finally, he did what he could to promote improved teaching. In 1847 he established the first teacher-training institution and he constantly attempted to set progressively higher standards for the certification of elementary school teachers. Ryerson’s achievement with respect to the grammar schools was twofold. First, by persuading the politicians and the public to accept the principle that grammar schools should have access to local taxation, he put these institutions on a sound financial footing for the first time in their history and transformed them into unequivocally public institutions. Secondly, he attempted to turn the grammar schools into effective secondary schools. By the gradual introduction of an entrance examination and a prescribed curriculum that clearly delimited the functions of elementary and grammar schools, he linked these institutions hierarchically. At the same time, he attempted to ensure that the grammar schools would offer a high-quality, broadly based education, consisting of English, mathematics, and classical studies, to that minority of students continuing beyond the elementary level. By creating an effective administrative system for his own department, Ryerson became a member of that small group of pioneer public servants who, in J. E. Hodgetts’ words, made responsible government “a working reality.” He established a strong central authority and a system of local inspection designed to ensure that provincial policy could be implemented and enforced. His own daily routine was dominated by an immense volume of correspondence generated by the problems of institution-building at the local level – correspondence that required him to write hundreds of letters a month in response to requests for guidance and advice. By careful attention to the detail of the organizational machinery at his command he secured both financial and administrative responsibility throughout the system. He reduced the routine work of administration as well as his relations with the local authorities to a body of systematic procedure that covered everything from the gathering of a multitude of statistics to the means by which local boards could function fairly and efficiently in the day-to-day running of the schools. An intensely methodical administrator, Ryerson created the first effective social service bureaucracy in the province’s history. He was, however, not only a school administrator but, in Alison Prentice’s phrase, a “school promoter” as well. Through his speeches, his educational tours of the province, and the Journal of Education for Upper Canada, which he edited from 1848 to 1875, he reported the best ideas from home and abroad, exhorted local boards to introduce this or that new idea, and launched his own campaigns for such major innovations as free schools and compulsory education. Part of his promotional task, perhaps the least welcome part, was to defend the place of grant-aided Roman Catholic separate schools within the system. Though these schools represented only a small proportion of the total number of schools in operation, they became the subject of prolonged political, religious, and sectional controversy in the mid 19th century. Though Ryerson had no a priori objections to denominational schools where a common faith was shared by the whole population, he did not approve of sectarian schools in a denominationally diverse society like Canada West. He thought such schools impractical in most parts of the country, divisive, and unnecessary on the grounds that all the essential, shared doctrines of Christianity could be taught in the elementary schools without reference to the peculiar doctrines of each sect. 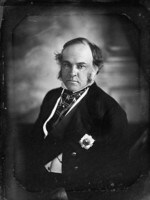 None the less he had inherited responsibility for the separate schools from the School Act of 1841 and could see no way of abolishing them, given the union of the Canadas which ensured the Catholic minority of Canada West the powerful support in the legislature of their Lower Canadian brethren. Thus Ryerson found himself repeatedly forced to defend the status quo, or to justify a succession of unpalatable political compromises on the issue, in an attempt to fend off both the abolitionists and those who sought the extension of the Catholic system. The additional rights won by Roman Catholics in 1853, 1855, and 1863 were modest compared to their demands; Ryerson was largely successful in preserving the unity of the school system. But his role made him appear to endorse the survival of the separate schools against the clearly expressed will of the majority of politicians and electors in Canada West, and kept him deeply embroiled in public debate from 1852 to 1865, when the issue was finally disposed of as part of the confederation settlement. If Ryerson disliked the separate school controversy, however, it was because he believed the question to be insoluble and divisive, not because he thought it inappropriate for public servants to become involved in political questions. 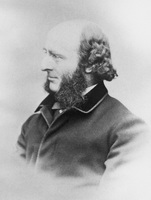 The modern conventions of civil service neutrality and anonymity were still in a formative stage in the period and Ryerson stands out as a Canadian example of that transitional group of mid-Victorian reformer-bureaucrats whom George Kitson Clark has labelled “statesmen in disguise.” Because Ryerson believed that the disposition of educational issues should not be subject to politics or partyism, he had made the Education Office a semi-autonomous agency with no distinct ministerial head. Though formally responsible to the Executive Council, Ryerson himself assumed an almost ministerial role. He established policy, sought political support for it inside and outside parliament, and defended it in public. Moreover his notion of his public duty transcended responsibility to a particular ministry or even parliament. In effect he saw himself as the guardian of the public interest in all educational matters. Even in the late 1860s Ryerson did not think it anomalous, when his own views conflicted with those of a member of the cabinet, to confront the minister with the threat that he would take his side of the case directly to the public. Nor did he feel constrained to keep his activities within the formal jurisdiction of his office. While in England in 1851, for example, he acted as an emissary for the administration to the Colonial Office on the clergy reserves issue and published anonymous letters on the same subject in the Times. 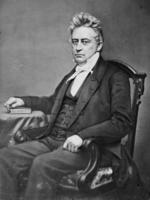 He regularly exchanged political gossip and advice with politicians to whom he was personally close, especially William Draper, Francis Hincks, and John A. Macdonald*, and on at least one occasion privately used his influence among Methodist leaders to sway their politics and their votes. Throughout his superintendency, moreover, he remained an active participant in the affairs of Upper Canadian Methodism. 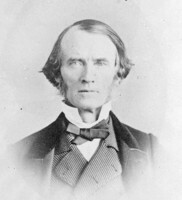 With the exception of the year 1854–55, when a brief but tempestuous dispute over the rights of Methodist ministers to require attendance at class meetings led to Ryerson’s temporary resignation from conference, he continued to serve on important conference committees, including the board of Victoria College. In the late 1860s and in the 1870s he was an active supporter at conference of the negotiations for Methodist union and was honoured in 1874 for his contributions to the institutional development of Canadian Methodism by his election as the first president of the Methodist Church of Canada. This continuing clerical role, however, involved him once again in a highly contentious political issue, the university question. Ryerson always claimed that he was a warm supporter of a provincial university, and no doubt he was in the sense that he generally supported any measure that would sustain effective professional schools and provide common standards for examinations and degrees among the various colleges in the province. Indeed he himself had written the original draft of Hincks’s University Act of 1853, which incorporated these ideas. But Ryerson was also a resolute defender of the denominational colleges as agencies for ensuring a Christian education and environment for young men who did not live at home. And he had an immense personal commitment to the survival of Victoria College, which he had done so much to foster in the 1830s and 1840s. For both reasons he was an energetic supporter of public aid to the denominational colleges throughout the 1850s and 1860s. 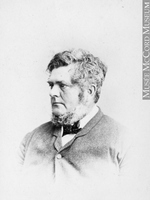 He took a leading role between 1859 and 1863 in the concerted attempt by several denominations to force the government to give them access to the funds of the University of Toronto and in the abortive campaign in 1868 to prevent the new government of Ontario from abolishing the existing grants to the denominational colleges. In the controversy surrounding the question, Ryerson always attempted to claim the high ground as champion of the interests of Christianity and high standards in education. But to those who believed in the virtues of a civic university, free from sectarian control and large enough to offer a comprehensive liberal and professional education, he inevitably appeared as the partisan of denominational self-interest and sectarian political scheming. The 1850s were for Ryerson among the most satisfying years of his life. He had experienced his share of personal tragedy in the two previous decades with the deaths of his first wife and both their children. By the 1850s, however, he and his second wife had settled in a comfortable house in Toronto, and had two growing children, Charles Egerton and Sophia. Though Charlie was a constant worry to his father because of his lack of earnestness and studiousness, he became a welcome sporting and sailing companion later in Ryerson’s life. Sophie, as Ryerson’s warm and often moving letters to his daughter reveal, was the love of his life, particularly since his relationship with his second wife was somewhat distant and at times strained. The 1850s were also among his most productive years as superintendent. In a sequence of major legislation between 1850 and 1855 he had put the common school system in order, begun the reform of the grammar schools, and played a role in reshaping the provincial university. He was on close terms with most of the influential politicians of the day, and received broad support from both parties and from the provincial press; even the Globe found good things to say about him for much of the decade. 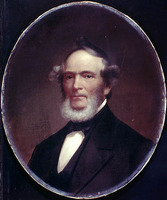 He basked in the accolades of Lord Elgin during ceremonies connected with the building of the Normal School in Toronto, and was invited in 1854 to serve as a member of a commission of inquiry into the state of King’s College (University of New Brunswick) in Fredericton, N.B. 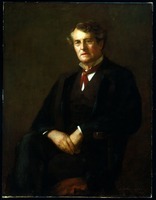 Among other ornaments of public approbation he accumulated three honorary degrees: a dd from Wesleyan University, Middletown, Conn., in 1842; an ma from the University of Toronto in 1857; and an lld from Victoria College in 1861. His reputation and his public role seemed permanently and securely established. Towards the end of the decade, however, both his personal and his professional circumstances became more troubled. In the late 1850s his pride was badly wounded by a contretemps with John Langton*, the provincial auditor. 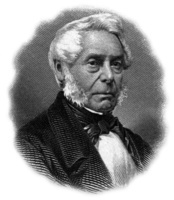 Langton, the first to admit that Ryerson was a superb administrator, had written in 1856 that Ryerson had “the genius of order and system,” and that “his accounts and vouchers are a model for all our public departments.” But between 1855 and 1857 Langton also discovered and exposed the fact that Ryerson had personally collected the interest on public funds held in his name. It was not an illegal practice at the time, and Ryerson believed he had ministerial approval for it, but it was also ceasing to be acceptable conduct in the public mind. He promised to pay back the entire amount and a sympathetic government granted him virtually the equivalent sum in back salary. But he was stung by the accusations against his probity and shaken by the way in which those charges remained current long after the issue had been formally settled. Then, in 1862, approaching the age of 60, Ryerson suffered a prolonged and severe illness marked by the recurrence of headaches, dizziness, and coughing. His illness forced him to reduce his traditional schedule of work and as he recovered in the succeeding years he took his first real vacations and embarked on a regimen of vigorous exercise. Among other things he built a skiff, and over the next few years sailed and rowed nine times from Toronto to Long Point, five of these adventures, much to the consternation of friends and family, being undertaken alone. Though he would regain much of his strength by the mid 1860s, he would suffer relapses for the rest of his life and was never again able to carry the burden of work he had once borne. Illness and the frustrations of public life led Ryerson to talk sporadically about retirement throughout the 1860s. At the same time, however, he was anxious to complete his agenda for educational reform. In 1866–67 he made his last educational tour of Europe and America, out of which came two reports, written in 1868: one on the education of the deaf, dumb, and blind, and the other on the state of American and European education along with recommendations for the improvement of the Ontario system. Late in the same year he submitted draft legislation designed to improve the details of school law and to introduce universal free elementary education, compulsory attendance, and a new structure for secondary education. His initial hopes for quick and easy passage of the school bill were soon dashed. In part this disappointment was due to the constant attacks mounted by the opposition Liberals, many of them directed at Ryerson personally. But it was also due to the emergence of real public debate about a wide variety of educational issues. Differences of opinion in the legislature and the press, along with opposition to parts of the bill from teachers’ organizations and from local opinion expressed during Ryerson’s tour of the province in 1869, led to the temporary withdrawal of the bill and to considerable modification of it. The new School Act, finally passed early in 1871, contained most of Ryerson’s major recommendations in one form or another and remains as one of the great landmarks of his career. But it was passed amidst a degree of political debate and personal bitterness not experienced by Ryerson since the late 1840s. The conflicts of the years 1872–75 invited either resignation or dismissal. Yet neither option could be exercised. 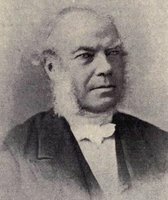 Ryerson repeatedly expressed a wish to resign but he did not have the financial resources to sustain himself independently: for years he had given generously to help finance a variety of Methodist causes including Victoria College, he had a nephew to educate, and he may also have lived somewhat beyond his means. Thus he needed to assure himself of a government pension and could not afford to make any grand gestures over policies with which he disagreed. Either Blake or Mowat would probably have welcomed his resignation but there were political difficulties in providing him with a permanent pension and differences within the Liberal party itself over the kind of reorganization the Education Office should undergo. Dismissal, on the other hand, was out of the question. Ryerson’s reputation remained high in many quarters and he was still, as even the Liberals recognized, a power among Methodist voters. It was not until late 1875 that Mowat finally took the matter in hand, and made the decision to create a ministry of education [see Adam Crooks] and to provide a pension for Ryerson. He formally left office in February 1876, just over a month before his 73rd birthday. Retirement, however, did not mean a life of leisure. Since the early 1860s Ryerson had devoted his spare moments to what he was convinced was his last “mission” in life – a history of the United Empire Loyalists. In 1876 the project became his full-time occupation and most of that year was spent in England where he put in long hours of research in the British Museum. Over the succeeding five years he finished the two large volumes that make up The loyalists of America and their times. Beyond that he completed a school textbook on political economy and a history of Canadian Methodism. He was working on his autobiography when, in the summer of 1881, his health began to fail. He died on 19 Feb. 1882. Following a large and impressive funeral service he was buried in Mount Pleasant Cemetery, Toronto. Ryerson’s life spans the growth of Upper Canada virtually from first settlement to the social and economic maturity of the 1870s. For most of those years he was a major figure in its history. Particularly before 1850 he played a central part in the institutional growth of Methodism, one of the province’s largest denominations. As well, he helped to articulate and publicize “the grievances of Upper Canada,” and contributed to the debate about the nature of colonial-imperial relations. If most historians now reject an older view that Ryerson determined single-handed the results of the elections of 1836 and 1844, still he remains an influential figure in these events and one of the leading spokesmen for that majority of Upper Canadians who sought some middle way to reconcile self-government and the imperial tie. But it is his contribution to Canadian education that remains his greatest legacy. He was one of the founders of Victoria College, its first principal, and a generous benefactor through some of its most difficult years. He was a vigorous protagonist of the right of all the denominational colleges to survive and prosper in the province. And he attempted to make the grant-aided schools universal and comprehensive and to create an effective system of public administration at both the local and provincial levels. Few of his educational ideas were original. John Strachan, for one, had anticipated many of them, while others were the common coinage of an era when school systems were being constructed in many different places. Nor was his vision without flaws. He had an unsure hand when it came to providing for the advanced education of young women. To some of his contemporaries his version of non-denominationalism in education appeared as little more than a disguised and proselytizing form of evangelical Protestantism. And his hopes for social improvement through education were vitiated by a belief, widely shared by his generation, that social and economic inequalities were the unchangeable realities of man’s fallen estate. During his lifetime there were already divergent views about the merits of the school system, and since his death the assessments of his work have been diverse and conflicting. But on one point there has been consensus. More than any other person Ryerson gave the Ontario school system its particular character, one that, because of his enormous influence in his own generation, would become during the later 19th century a model for most of English-speaking Canada. [Egerton Ryerson’s writings were extensive, both in manuscript and in print, and there is also a considerable body of historical work relating to his life. Aspects of his career, for example, are treated in all of the standard works on 19th-century Ontario and he plays a particularly important role in the histories of religion and education. There are three major collections of Ryerson papers. Most of his personal correspondence is in the Egerton Ryerson papers at UCA but there is also a small, important collection of correspondence in the Hodgins (John George) papers (MU 1375–81) at AO. The immense files of the Education Department (RG 2) at AO also contain many series which are valuable for various aspects of Ryerson’s work: the most important are C-1 and C-2, which consist of the letterbooks and drafts of outgoing correspondence, and C-6-C, the incoming correspondence. Though these files deal mainly with routine administrative matters, they also include important political correspondence and Ryerson’s views on the widest variety of subjects. There are many other state and personal manuscript collections in various Ontario depositories that contain letters or statements by or about Ryerson. Perhaps the most valuable are the John A. Macdonald papers (MG 26, A) at PAC. Ryerson used the press extensively to promote his views and reply to his critics. Thus such papers as the Kingston Herald (Kingston, [Ont.]) and Toronto’s British Colonist, Globe, and Leader are valuable sources. By far the most important, however, is the Christian Guardian, and not only during his editorship, for he was a contributor all his life. As well there is the Journal of Education for Upper Canada (later the Journal of Education for Ontario) (Toronto), which he edited from 1848 to 1875. Aside from the routine administrative business of the Education Office the Journal contains important editorials by him and most of his major speeches on educational matters. The annual reports of the Department of Public Instruction for Upper Canada and later Ontario, published between 1846 and 1875, were largely his work and contain important material on all aspects of the development of the school system. He also wrote a number of special reports on educational subjects, most of which are printed in the appendices to the Journals of the Legislative Assembly of the Province of Canada and the Sessional papers of the province of Ontario. Over his lifetime he wrote a large number of pamphlets and books on a broad range of topics, including politics, religion, education, and history. Most of these are listed in Bibliography of Canadiana (Staton and Tremaine) or can be found in the pamphlet collection at AO. Some of his more important and representative works are: Letters from the Reverend Egerton Ryerson to the Hon. and Reverend Doctor Strachan . . . (Kingston, 1828); The affairs of the Canadas, in a series of letters, by a Canadian (London, 1837); Sir F. B. Head and Mr. Bidwell; the cause and circumstances of Mr. Bidwell’s banishment by Sir F. B. Head, correctly stated and proved, by a United Empire Loyalist (Kingston, 1838); The clergy reserve question; as a matter of history – a question of law – and a subject of legislation; in a series of letters to the Hon. W. H. Draper, M.P.P. (Toronto, 1839); Inaugural address on the nature and advantages of an English and liberal education, delivered . . . at the opening of Victoria College, June 21, 1842 . . . (Toronto, 1842); Sir Charles Metcalfe defended against the attacks of his late counsellors (Toronto, 1844); Report on a system of public elementary instruction for Upper Canada (Montreal, 1847); Dr. Ryerson’s letters in reply to the attacks of foreign ecclesiastics against the schools and municipalities of Upper Canada . . . (Toronto, 1857); Dr. Ryerson’s letters in reply to the attacks of the Hon. 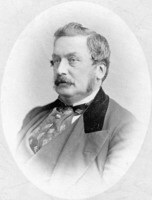 George Brown, M.P.P. (Toronto, 1859); University question: the Rev. Dr. Ryerson’s defence of the Wesleyan petitions to the legislature, and of denominational colleges as part of our system of public instruction, in reply to Dr. Wilson and Mr. Langton . . . (Quebec, 1860); The new Canadian dominion: dangers and duties of the people in regard to their government (Toronto, 1867); A special report on the systems and state of popular education on the continent of Europe, in the British Isles, and the United States of America . . . (Toronto, 1868); First lessons on agriculture; for Canadian farmers and their families (Toronto, 1870); First lessons in Christian morals; for Canadian families and schools (Toronto, 1871); Elements of political economy; or, how individuals and a country become rich (Toronto, 1877); The loyalists of America and their times: from 1620 to 1816 (2v., Toronto and Montreal, 1880); Canadian Methodism; its epochs and characteristics (Toronto, 1882). Many of Ryerson’s more important letters and reports are published, sometimes in highly edited form, in Documentary history of education in U.C. (Hodgins). Though these volumes need to be used with care, they remain indispensable. An invaluable collection of personal correspondence is found in My dearest Sophie; letters from Egerton Ryerson to his daughter, ed. C. B. Sissons (Toronto, 1955). A formal record of Ryerson’s role in Methodism can be found in the published and unpublished minutes of the conferences of the various Methodist churches in Canada from 1824 to 1874. Ryerson’s autobiography was incomplete at his death: it was edited by John George Hodgins* and published in 1883 as The story of my life . . . (Toronto). There are several other biographical studies. Nathanael Burwash* wrote Egerton Ryerson (Toronto, 1903; revised and enlarged by C. B. Sissons in 1927) before J. H. Putman produced Egerton Ryerson and education in Upper Canada (Toronto, 1912), and Clara Thomas has written a brief but vivid character study in her Ryerson of Upper Canada (Toronto, 1969). An excellent introduction for young people is Laura Damania’s Egerton Ryerson (Don Mills, Ont., 1975), which was translated into French the next year by Richard Bergeron and published at Longueuil, Que. The definitive biography, however, is Sissons, Egerton Ryerson. Though now dated in some respects, this work is richly textured, lucid, and comprehensive. Much of Ryerson’s important correspondence is reproduced in its two volumes. Ryerson’s role in the development of early Canadian Methodism is considered in G. [S.] French, Parsons & politics: the rôle of the Wesleyan Methodists in Upper Canada and the Maritimes from 1780 to 1855 (Toronto, 1962) and a contemporary perspective is added by John Carroll in Case and his cotemporaries. His part in the university, separate schools, and clergy reserves questions is put in context in J. S. Moir, Church and state in Canada West: three studies in the relation of denominationalism and nationalism, 1841–1867 (Toronto, 1959). On the separate school question see also F. A. Walker, Catholic education and politics in Upper Canada: a study of the documentation relative to the origin of Catholic elementary schools in the Ontario school system (Toronto and Vancouver, 1955; repub. Toronto, 1976). For the intellectual background of Ryerson’s thought see McKillop, Disciplined intelligence. There are few studies of 19th-century Ontario education in which Ryerson does not play a significant part. 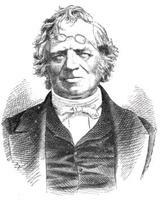 Two of the more important recent contributions primarily concerned with him are A. F. Fiorino, “The philosophical roots of Egerton Ryerson’s idea of education as elaborated in his writings preceding and including the report of 1846” (phd thesis, Univ. of Toronto, 1975), and Alison Prentice, The school promoters; education and social class in mid-nineteenth century Upper Canada (Toronto, 1977). His contributions to Victoria College are considered in C. B. Sissons, A history of Victoria University (Toronto, 1952). R. D. Gidney, “RYERSON, EGERTON,” in Dictionary of Canadian Biography, vol. 11, University of Toronto/Université Laval, 2003–, accessed April 20, 2019, http://www.biographi.ca/en/bio/ryerson_egerton_11E.html.